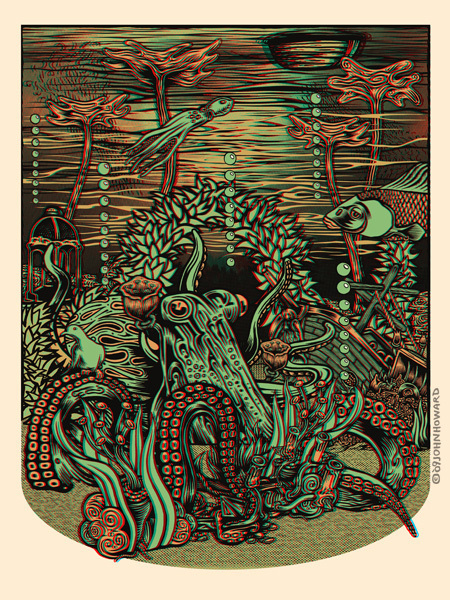 Grab your 3D glasses to get the most out of this interpretation of the Octopus' Garden in the shade. :) It will be showing at.. The new Beatles museum in Hamburg, celebrates the Beatles formative days on the Reeperbahn. It's called the Beatlemania Museum. It has five floors, 1300 square meters of Beatles stuff, a yellow submarine... It's right on the Reeperbahn near where Flatstock is located. The Participating artists created an art print, as a visual interpretation of a Beatles song of their choice. Each is the artists own response to the song, done in the artists own style, as a limited-edition art print. It's an 18x24 4 color screen print edition of 100 some will be available here after the show.